Within two weeks of the first announcement of 3D XPoint Memory, at the 2015 Flash Memory Summit, I knew and explained that the technology would take two years or more to reach manufacturing cost parity with DRAM, even though Intel and Micron loudly proclaimed that it was ten times denser than DRAM. This density advantage should eventually allow XPoint manufacturing costs to drop below DRAM costs, but any new technology, and even old technologies that are in low-volume production, suffer a decided scale disadvantage against DRAM, which sells close to ten billion units per year. If the sales price of a chip is lower than its cost to manufacture the manufacturer loses money. Intel is losing money on 3D XPoint Memory by selling it at a price that is below its production cost (as I recently pointed out in this post.) Since Micron owns the XPoint manufacturing plant (IMFT) Micron deeply understands this, and has a very solid knowledge of where production costs are today, and where they are likely to be over the next several quarters. Why is XPoint losing money? This is relatively simple to explain. 3D XPoint Memory won’t fit into the memory/storage hierarchy unless it is sold for a lower price than DRAM. This is something that I regularly explain by using this chart, which shows how the Memory/Storage Hierarchy works. The short explanation of this diagram is that each level of the hierarchy, from the three cache levels on the upper right to tape on the bottom left fits within the hierarchy as long as it’s cheaper than the next faster level, and faster than the next cheaper level. If it doesn’t fit, then computers will use a cheaper alternative that provides equal or better performance. 3D XPoint Memory can fit between DRAM and SSDs as long as it’s faster than NAND flash (which it is by its very nature) and it costs less than DRAM, which today is an issue. 3D XPoint must sell for a lower price than DRAM or it will not be adopted. Since XPoint uses a new technology that is not yet in high-volume production it will continue to cost more to produce than DRAM until its production volume approaches that of DRAM. Production costs will drop below DRAM costs as volume increases, but volumes will only increase if it’s priced below DRAM. This is a Chicken-and-Egg problem. Since mid-2015 Objective Analysis has held the position that for the next 2+ years Intel will need to sell XPoint at a loss to cultivate a market. It is now 3½ years later, and this product still seems to be having trouble reaching cost parity with DRAM. So it costs more to produce than the price it must sell for in the market. Anyone who sells it will lose money. Intel has been addressing the issue of platform performance since the early 1990s. A part of this has been the company’s orchestration of DRAM interface migration: FPM, EDO, SDRAM, DDR, DDR2, DDR3, & DDR4. The company discovered that poorly designed 486-based systems could impede their high-end CPU sales, so they have worked tirelessly ever since then to assure that the platform does nothing to slow the performance of Intel’s highest-performance processors. Intel may lose $10/system for the Optane it sells, but that will enable it to sell a $50 more expensive CPU (these are completely fictitious numbers). While this is good business, it means that only Intel can make money by selling 3D XPoint at a loss. Micron will need to wait until XPoint’s cost drops below DRAM costs to make money selling Quantx. As a result, readers shouldn’t expect to see Micron promote QuantX until 3D XPoint’s cost falls below that of DRAM. And with a DRAM price collapse already started, this could be a very long time. There’s no wonder that Micron has been so quiet about QuantX. Its manufacturing cost isn’t yet low enough to make sense. It also makes sense that Samsung’s response to Optane is to make a fast NAND flash – Z-NAND. The company can do this by customizing the circuitry inside of standard NAND flash chips, and these changes don’t require any new technology. Z-NAND will be built using Samsung’s existing NAND process but with a different chip layout (i.e. lots of planes & sense amplifiers). They are betting that they don’t need to debug a new memory technology to participate in the new memory layer. Other companies hope to compete against 3D XPoint with various alternative technologies (i.e. ReRAM, MRAM, etc.) Any company that embarks on this path will need to simply eat the loss for 2+ years without any hope of ever recovering it. It’s hard to imagine that anyone will really do this. 8 Responses to Where is Micron’s QuantX? intel just killed the cpu+optane bundles, at least for consumer side, that says a lot. marketing 16gb optane + 4gb dram as 20gb ram didnt help either.. Yes. It’s hard to see why a consumer would be attracted to one of the Optane bundles. The few who understand that they want more DRAM are likely to buy more DRAM. I want to see this tech or tech like it put out for mass storage to replace the deadend nand flash with it’s limited re-write lifespan. I don’t care about using it for system ram, because it also has a limited re-write life, just a lot longer the flash. Flash is fin for storing stuff like settings, but not for main storage. I want stuff I buy to last. Peter, Not at all plagiarism. The Seeking Alpha writer who goes by the name “Gold Panda” reported on an article I wrote and a presentation I made. I, in turn, decided to turn that presentation into a blog post. Both cite the same source, but that happens all the time in articles. Also consider the fact that the author and I came to completely different conclusions. Thanks for pointing out the article, though. I hadn’t seen it before. That article literally cites Objective Analysis. So he did not plagiarize himself. 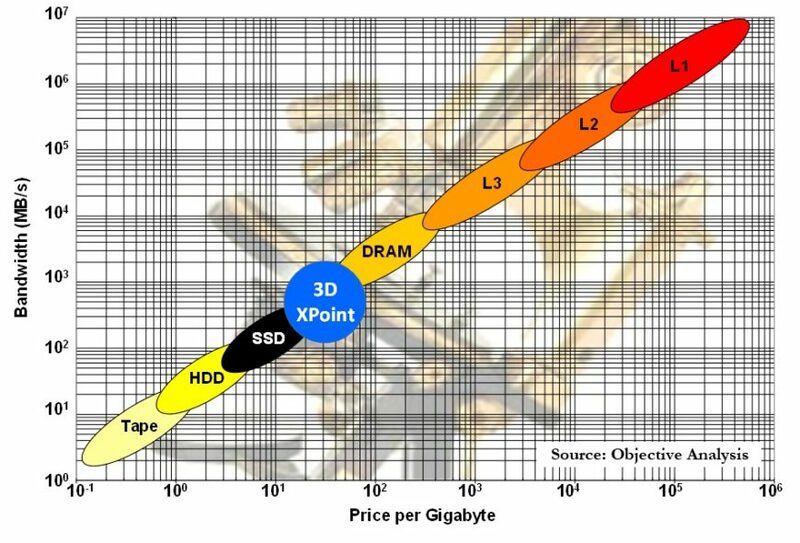 As opposed to what is written here, 3D-Xpoint price per GB is cheaper than DRAM by a factor of 2 or more (Amazon). I have made some small corrections to the post that will hopefully clarify the point.